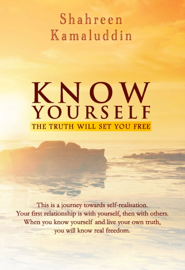 Know Yourself - The Truth Will Set You Free - is a collection of insights that lays bare the precise diagnosis for reshaping our inner most thoughts and beliefs which often cause recurring negative experiences in our lives. It is also an invitation that challenges readers to acknowledge the part they play in determining their own destinies… If you read it with honesty, it can shed light on why destructive patterns repeat themselves – why you are unable to say “no”, frequently fall into injurious relationships or run into the very situations you fear most. Simple guidance is included on how to remain detached from outcomes, handling dissenting opinions, check unrealistic expectations, and sustaining personal equilibrium. Confidence, composure and quiet self-assurance are the rewards. "This book will help you know yourself and it will unfold the magical and miraculous in your life." Author of "How To Know God - The Soul's Journey Into the Mystery of Mysteries"
a fulfilled and successful adventure." Co-creator, #1 New York Times bestselling series, "Chicken Soup for the Soul"
“Here is an invitation to realise your magnificence and power to create a life of joy for yourself. You Are What You Believe - is one of the most beautiful truths you will ever read. Properly employed, the concepts in this book can become a mental magic wand which will transform your life. The basic truths you will find on every page have been used by a select group of people living what most others consider a charmed life. Shahreen explains how the use of your marvellous mind will give you anything and everything your heart desires. Each new concept brings with it a wonderful gift…a heightened belief in yourself and your ability to do greater things. When you finish reading this book, you will see yourself in a new light. "Affirmations are the easiest way to reprogramme our thinking for success and happiness. 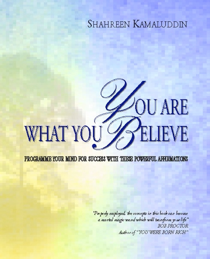 Shahreen outlines the function of the mind, explains how affirmations work and gives you a smorgasbord of smorgasbord of affirmations which you may apply to every area of your life. Affirmations work. They have worked for millions. This book can work for you"